WHAT HAPPENS IN THE ORDER PROCESS? Choose your invitations and other stationery from our store, along with envelope calligraphy, save the dates and an invitation sample if you so choose. Select which items you require (invitation, RSVP, details) and the price bracket that applies to your guest number (for example if you want to order 90 invites, in the Guest Number dropdown menu select 75-99). Then choose colours, enter the exact number you wish to order in the Quantity box, add to your cart and head to the checkout! 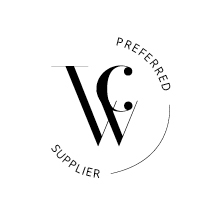 You'll receive an order & payment confirmation, then one of the lovely reps at White Letter will get in touch via email to organise design proofs (draft layouts of your invitations), which you will make changes to if needed and then approve for printing. You get up to 3 proofs free of charge, and additional proofs will incur an extra fee. This process can take 24 hours if you're happy with the initial proof and everything is ready to go, otherwise we might spend a few days emailing to get the layout just right. Also, during busy periods this may be drawn out a little longer. Please note that your invites will be created according to the templates pictured – if you prefer a different layout, then a custom suite may be your best option. I live on the Gold Coast. Can I pick up my order for free? Yes, you can. Simply check the 'Free pick up' option when you process your order at the checkout. Pick up is from Mermaid Waters, Gold Coast, QLD. Lead times are seasonal, as some periods of the year are busier for us than others. In quiet periods we suggest a standard 1 week order processing time + shipping once your designs have been finalised (important: this period begins once you have approved the final design proof). In busy periods we suggest that you allow 1-3 weeks for your order to be processed. We always aim to turn over orders quickly, and if you have an urgent time requirement all you have to do is let us know so we can prioritise it. Regular shipping usually takes 2-4 days within QLD, or 2-5 days interstate. Express shipping is 1-2 days within QLD or 1-3 days interstate. See below for busy periods. Our pricing is based on materials and printing costs, which generally become less expensive with higher print numbers. Thicker card stocks and cotton based stocks are slightly more expensive. Our gold foil and letterpress options are beautiful and add a level of luxury to our invitation suites, and require a more intensive printing process. Special printing plates and heating processes are used to create these specialist finishes, which is why these printing options are more expensive. The print minimum for gold foil and letterpress is 50 units. CAN I PRINT LESS than 25 units? Our print minimums are set at 25 because pricing below this number goes up significantly. As a general rule, pricing is most reasonable per unit for orders 50 and above. Do you do your lettering by hand? Most of our semi-custom suites are created with either existing fonts or hand-penned custom calligraphy. Most of our place cards and envelope calligraphy is done by hand, though there are some printed options also available. We can also create invitation designs by hand with our fully custom suite service. Yes, all of our invitation options include complimentary envelopes to match your invitations and RSVPs. If you would like to purchase envelopes by themselves, please contact us at info@whiteletter.co for a quote. do you print gold foil? and letterpress? Yes and yes! We can print gold, silver, rose gold, champagne gold and copper foil. Some suites have foil options, otherwise we can design something unique for you with a fully custom foil suite. We can give you free advice on this – just ask! Otherwise we offer a table styling service for Gold Coast weddings. Prices start at $100 and can include on-the-day place setting of your cutlery, napkins, plateware, glassware, menus and place cards. This is a great option for DIY weddings, where you have done the planning yourself but need somebody experienced to set the tables to perfection. Click here if this service interests you! I would like to see your products before i buy. how can i do this? If you are local to the Gold Coast, we can arrange a meeting so that you can look at our available range of card and printing finishes and decide what you'd like to go forward with. Just send us an email at info@whiteletter.co to arrange a time, with 'Appointment' in the subject line. Alternatively, we can send you a printed sample of your invitation before we send the final proof for printing – this service is free for custom invitation suites or $10 extra for semi-custom suites. Do you collaborate with other creatives? Yes, we love it! We have a network of vendors with whom we regularly collaborate, and while this keeps us busy we are always open to taking part in photoshoots or creative projects when we have the time. Please email us at info@whiteletter.co to find out our availability. If you are using the services of one of our friends, you are eligible for a 10% discount with White Letter. To claim, simply send us an email with a description of the products you require, and the name of the vendor who is listed on our website listed as a friend.